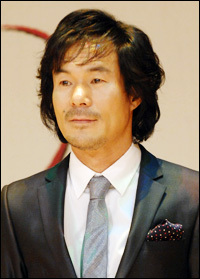 Popular actor Oh Gwang-rok, most famous for his role in ``Taewangsasingi'' (The Four Guardian Gods of the King)'' as a wise man, was arrested Thursday for smoking marijuana, police said Friday. According to Namdaemun Police Station, Oh is suspected of having smoked marijuana on several occasions, including once in February at his house in Seoul. He allegedly smoked with the head of an unidentified information-technology company, known as Park, investigators said. Police said Park bought the drug from a local dealer and shared it with eight others, including animation film director Kim Mun-saeng.